The six-month-old female calf was discovered on the Yamal peninsula of Russia and is thought to have died 10,000 years ago. The animal’s trunk and eyes are still intact and some of its fur remains on the body. The 130cm (4ft 3ins) tall, 50kg Siberian specimen dates to the end of the last Ice Age, when the great beasts were vanishing from the planet. It was discovered by a reindeer herder in May this year. Yuri Khudi stumbled across the carcass near the Yuribei River, in Russia’s Yamal-Nenets autonomous district. Later in the article we learn that the discoverer, Yuri Khudi is not alone when it comes to discovering mammoth remains, as many other indiduals are leaving no block of frozen soil unturned in their efforts to recover other remains, whose various components have fuelled a growing market in the trade of mammoth ivory, and even mammoth hair which is rumoured to fetch no less than $50 per inch – I’m not entirely sure how collectors of mammoth hair would exhibit their prized possessions, although I can imagine some might opt to have wigs or toupées woven into ill-fitting and ruinously expensive conversation pieces. “To find a juvenile mammoth in any condition is extremely rare.” Dr Agenbroad added that he knew of only three other examples. Some scientists hold out hope that well preserved sperm or other cells containing viable DNA could be used to resurrect the mammoth. Despite the inherent difficulties, Dr Agenbroad remains optimistic about the potential for cloning. 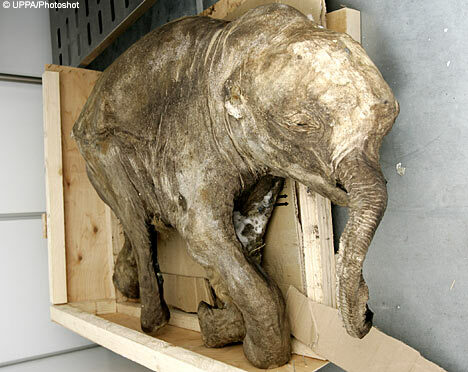 “When we got the Jarkov mammoth [found frozen in Taimyr, Siberia, in 1997], the geneticists told me: ‘if you can get us good DNA, we’ll have a baby mammoth for you in 22 months’,” he told BBC News. That specimen failed to yield DNA of sufficient quality, but some researchers believe it may only be a matter of time until the right find emerges from Siberia. Bringing mammoths back from the dead could take the form of injecting sperm into the egg of a relative, such as the Asian elephant, to try to create a hybrid. Alternatively, scientists could attempt to clone a pure mammoth by fusing the nucleus of a mammoth cell with an elephant egg cell stripped of its DNA. And to prove his case, he is turning 160 sq km of Siberian “desert” back into the teeming wilderness of the late Ice Age, complete with grazing pastures and animals that have not been seen here for millennia. If we had travelled north we could have reached the Bering Strait and the US in one day by boat. Instead, we are going south, and back in time, to “Pleistocene Park“. So far there are fewer than 100 large mammals at work, making progress painfully slow, but Sergei hopes to increase the herds and within five years have 10 times as many, enough he believes to dramatically accelerate their effect on the habitat. “Next year or two: bison from Canada, then musk ox, then eventually we will have 20 mammals per square kilometre,” he says. I admire Zimov’s ambition. I hope his plan works out. This is a very interesting find. Keep doing the good work you are doing. David – re Zimov, I agree, it’s often surprising how much one dedicated person can achieve in such ventures, it’ll be interesting to see how far succeeds. Bob – thanks for your comment, I’ll keep an eye out for further updates to this story. MAy bbe hie missed that movie . . . you know the one . . .oh yeah JURASSIC PARK. Remember how well *that* worked out?